This is one of the strangest looking “creature” objects in space. It almost looks like this is about to gobble up a galaxy. 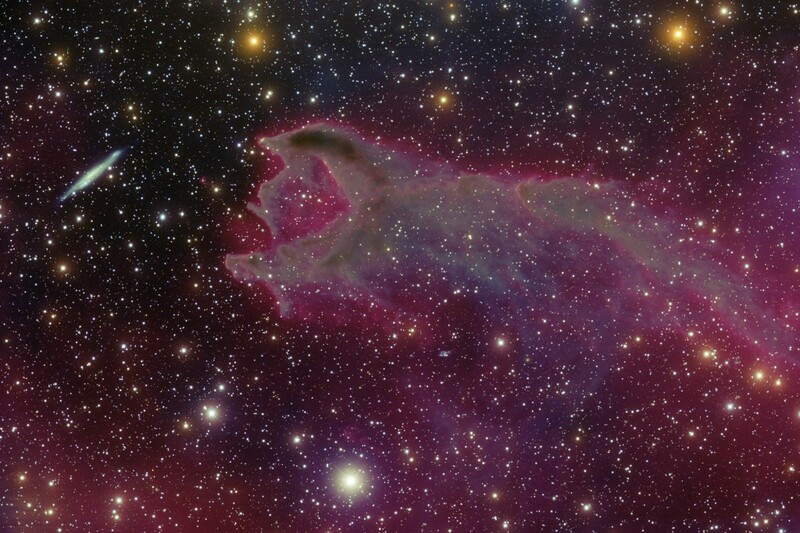 This is known as a cometary globule or CG4. This is a star forming region that could produce several suns like our own. Cometary Globule CG4 is located 1,300 light years away from Earth and its head is about 1.5 light years across. The actual size including the tail is about 8 light years long. The head is illuminated by the stars that are forming. The red that is glowing in the head is super charged hydrogen. The galaxy you see on the right is actually at least 100 million light years away from CG4. The cometary globule in this image has ruptured and reasons for this are still unknown. Even though CG4 looks like a comet it is certainly much different. There isn’t a lot of information on cometary globule but with more scientific efforts from Hubble and other space programs we can unlock the secrets to such interesting “creature” looking objects. For more information you read more here.